What lessons can one draw from the two crises? First, given the nature of the terrain through which the India-China LAC passes, allegations about incursions are likely to recur unless urgent steps are taken to delineate the LAC and demarcate it on the ground. This can be done through the setting up of joint working groups to survey the areas. Second, the media should be more circumspect in reporting news and organising ‘talk’ shows, whenever tensions develop in India&’s relations with its neighbours. There is a tendency among some of the ‘strategic experts’ to go ballistic and bay for the blood of the ‘enemy’, egged on by the anchor, rather than explain the perceptions of the two sides in a conflict situation which would promote a better understanding of the conflict among the public and also enable the policy-makers to take decisions based on sound deliberations. In the recent India-China stand-off, the conflict was blown out of proportion, and self-seeking political leaders made comments which ran counter to India&’s long-term interests. It goes to the credit of the government that the face-off between India and China could be settled through diplomatic negotiations, though the terms of settlement are not known. The India-China minuet on the border has continued for far too long and needs to be brought to an end, if relations between the two states are to be stabilised. Unfortunately, this is not happening because the settlement of the border conflict has become hostage to domestic political considerations, both for India and China, besides being influenced by geo-political factors. When the British left India, there was no agreed border between India and China delineated on the map and demarcated either in the western sector or in the eastern sector. After independence, one of the basic assumptions of the Government of India&’s policy on the border issue was that a series of unilateral assertions on the extent of India&’s border would be enough to give it sanctity, without realising that this could be gained only through mutual agreement. When the Chinese (PLA) forces entered Tibet in 1950, Nehru told Parliament in reply to a question on a new Chinese map ~ “Our maps show that the McMahon Line is our boundary, and that is our boundary-map or no map …and we stand by that boundary”. He was referring to the boundary in the eastern sector of the India-China border, though the Chinese ~ whether Communists or nationalists ~ had never accepted the legality of the McMahon Line. In fact, even many British officials had expressed serious reservations about its legality. In the western sector, independent India&’s claim was based on the views of the ‘Forward School’ strategist Sir John Ardagh, who had suggested in 1897 that the boundary between the north and eastern part of Kashmir and Tibet should be along the crest of the Kuenlun range. The idea was shot down by Lord Elgin, the then Viceroy and his advisers on the ground that this would not be of any strategic advantage to India. The boundary formally proposed by the Foreign Department of the Government of India and presented to the Chinese authorities in Beijing in 1899 by Sir Claude MacDonald, the British envoy to China (known as the Macartney-MacDonald Line), put forth a less ambitious claim of territory north of the Karakoram range and east of the Karakoram Pass, that left to China the whole of the Karakash valley and almost all of Aksai Chin proper, while it left on the Indian side the Lingzi Tang salt plains, the whole of the Chang Chenmo valley and Chip Chap river further north. Although the Chinese had not formally accepted the proposal, they did not reject it either because they themselves, through a unilateral move in 1892, had declared that the Karakoram ranges constitute the limit of Chinese territory. If the Prime Minister was candid enough to admit that the Aksai Chin was a disputed territory, why did he change his position later? For, in 1960 when relations between the two states plummeted to a new low, Zhou-en Lai made an attempt to settle the border dispute peacefully through a package deal. He had told Nehru that though China had never recognised the legality of the McMahon Line in the eastern sector, it was prepared to accept the McMahon Line alignments, as a possible boundary in the eastern sector, provided India recognised China&’s legitimate claims in the western sector, which primarily referred to the Aksai Chin area. But India&’s claim seemed to be as firm in the eastern sector as in the western sector. As late as September 1959, Nehru might have considered a compromise in the western sector. 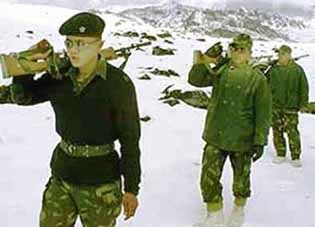 However, the border clash at the Kongka pass in that year and the Chinese criticism of India&’s decision to offer political asylum to the Dalai Lama in the wake of the crackdown in Tibet, sealed that possibility. Moreover, the government&’s decision to publish the diplomatic exchanges with Beijing, under parliamentary pressure, limited the scope for manoeuvre in negotiating with the Chinese, as any compromise settlement would be branded by the critics as a sell-out. Zhou-en Lai&’s offer certainly merited careful consideration. The Chinese did not have any firm basis to claim territories in the eastern sector, and would be willing to accept the McMahon Line alignment, with minor modifications, since it followed the watershed principle. In the western sector their claims had a firmer basis. Had Nehru accepted the offer, the border war of 1962 might have been averted. Deng Xiao-peng had renewed the offer in 1979, with some modifications, that reflected the realities on the ground; but India was not ready. The Chinese claims to major parts of Aksai Chin have now become non-negotiable, both because of historical reasons discussed earlier, and the fact that this area connects two of China&’s rebellious provinces. To strengthen their bargaining position in the western sector, they exerted pressure on India by claiming large tracts of territory in the eastern sector, where their claim is weak except perhaps in Tawang. Neither country wants a war. Overall peace and tranquillity has been maintained along the border. Yet the boundary problem has become intertwined with other issues and can be resolved only if both sides realise, as John Lal wrote in 1998, that the Himalayan crest “is the clearest possible dividing line” and that the crest-line must be established jointly through mutually agreed processes.